Wisconsin Historical Society Press, 9780870206689, 144pp. 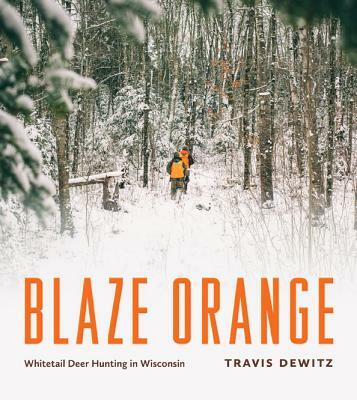 In Blaze Orange, photographer Travis Dewitz captures the joy, excitement, and camaraderie of deer hunting in Wisconsin. A lone hunter in a tree stand as dawn arrives. A girl and her grandfather scanning a field in the fresh snow. Tired hunters laughing around the evening fire back at camp. These are snapshots of a culture touchstone. With more than 600,000 hunters taking to the fields and woods of the state each year, the whitetail deer season is by far Wisconsin’s largest sporting event. Dewitz documents the hunt and more as he rides along with hunters and a game warden, visits local mom-and-pop stores where hunters gather, and records the industries that operate alongside the deer season—a taxidermist and knife maker, butchers and sausage makers. The result is a stunning and keen-eyed chronicle of one season of the Wisconsin deer hunt. Travis Dewitz is a professional commercial photographer based in Eau Claire, Wisconsin. His work has been honored with multiple awards and displayed in galleries in Wisconsin and California.